On June 29, 2018, Governor Snyder Signed HB 4265 (Hughes), 4185 (Bizon), and 4198 (Alexander) into law. PA 279 and 280 of 2018 require motorists to give three feet of space as they pass bicyclists on the roadways. PA 277 of 2018 improves drivers education in Michigan to put a greater emphasis on bicycle safety. PA 280 of 2018 requires a motorist attempting to overtake a bicyclist traveling in the same direction to the left of the vehicle give at least three feet of distance to the right of the bicyclist until they have safely cleared the bicyclist. (2) The driver of a vehicle may overtake and pass another vehicle upon the right only under conditions permitting the overtaking and passing in safety. The driver of a vehicle shall not overtake and pass another vehicle upon the right by driving off the pavement or main-traveled portion of the roadway. (3) The driver of a vehicle overtaking a bicycle proceeding in the same direction shall, when otherwise permitted by this section, pass at a distance of 3 feet to the right of that bicycle or, if it is impracticable to pass the bicycle at a distance of 3 feet to the right, at a safe distance to the right of that bicycle at a safe speed. PA 279 of 2018 requires a motorist attempting to overtake a bicyclist traveling in the same direction give at least three feet to the left of the bicyclist as they pass until they have safely passed the bicyclist. The motorist may drive to the left of the center of the highway to pass a bicyclist if it is safe to do so, regardless of if the vehicle is in a no-passing zone. (2) The driver of a motor vehicle overtaking a bicycle proceeding in the same direction shall pass at a safe distance of at least 3 feet to the left of that bicycle or, if it is impracticable to pass the bicycle at a distance of 3 feet to the left, at a safe distance to the left of that bicycle at a safe speed, and when safely clear of the overtaken bicycle shall take up a position as near the right-hand edge of the main traveled portion of the highway as is practicable. (3) Notwithstanding section 640, if it is safe to do so, the driver of a vehicle overtaking a bicycle proceeding in the same direction may overtake and pass the bicycle in a no-passing zone. This new law addresses how to safely pass when a bicyclist is traveling in the left lane. This can occur when a bicyclist is riding in the left lane of a one way street, or crossing into the left lane when preparing to make a left turn. This law does not allow motorists to pass to the right of a bicyclist when they are riding as far to the right as practicable or taking the lane. The Michigan Vehicle code already prohibits motorists to leave the roadway onto the shoulder to pass a vehicle, including a bicyclist. PA 277 of 2018 requires drivers education curriculum to include no less than one hour of classroom time devoted to laws pertaining to bicyclists, motorcyclists, and other vulnerable roadway users, including pedestrians. The laws of this state pertaining to bicyclists, motorcyclists, and other vulnerable roadway users shall also be incorporated to other parts of the drivers education curriculum where appropriate. Why are there two safe passing laws? PA 280 of 2018 deals with passing a bicyclist to their left while PA 279 of 2018 deals with passing a bicyclist on their right. Passing a cyclist on their left is the more common scenario. Under Michigan law, however, bicyclists are allowed to travel as far to the left as practicable on one-way roads. Drivers may also find themselves to the right of a bicyclist on multi-lane roads when that cyclist moves away from the right-hand edge of the road to position themselves to make a turn. Other exceptions are outlined in MCL Section 257.660a. This new law does not give drivers the right to pass bicyclists on the right by using the shoulder of the road. This remains illegal and extremely dangerous. I heard there is an exception to the three-foot law. Can you explain that? Yes, the language states, “if it is impracticable to pass the bicycle at a distance of 3 feet to the left, at a safe distance to the left of that bicycle at a safe speed, and when safely clear of the overtaken bicycle shall take up a position as near the right-hand edge of the main traveled portion of the highway as is practicable.” LMB fought to have this exception removed but ultimately the language remained in the final version of the legislation. LMB will continue to advocate to strengthen the safe passing law in future legislative sessions. What happened to five feet? The legislation was originally introduced as a five-foot passing standard. LMB advocated to retain the wider distance, but as with most legislation, considerable compromise was required in order to advance it through the legislative process. Going from a five-foot requirement to a three-foot one, as well as the addition of the “at a safe distance” language, came after a difficult battle. Throughout the process of getting this legislation passed, various amendments were proposed that could have actually made things worse for bicyclists, despite the intent of the legislation. Suggested amendments included the removal of a specific numerical distance entirely from the law, while another modified it to be five feet from the edge of the road, not five feet from the cyclist. One proposal suggested making the passing law seasonal, while another pushed to exempt drivers from having to safely pass if the cyclist was in a bike lane. Additionally, there was support for language that gave drivers two warnings before receiving points for a violation. In the face of these problematic proposals, a compromise was reached to codify three feet as the minimum distance to pass a bicyclist and to include the “at a safe distance” language. While this is ultimately not what LMB originally set out to enact, we believe PA 279 and 280 of 2018 are an important first step to improve public safety. LMB remains optimistic that the new laws provide a strong foundation for future legislation to make Michigan bicycling safer. There is still room for improvement on these issues and LMB looks forward to continuing to work with our membership to push for strong bicycle-friendly policies. Can a motorist pass a bicyclist in a no-passing zone? Yes, as long as it is safe to do so. PA 280 of 2018 states, “Notwithstanding section 640, if it is safe to do so, the driver of a vehicle overtaking a bicycle proceeding in the same direction may overtake and pass the bicycle in a no-passing zone.” While drivers are allowed to straddle the centerline as they pass a bicyclist, LMB recommends a complete lane change whenever it is possible and reminds drivers that it is their responsibility to ensure the oncoming lane is free of traffic, including bicyclists traveling in the opposite direction. Does the three-foot rule apply when bicyclists ride two abreast? Yes. According to MCL Section 257.660b, bicyclists can lawfully ride two abreast: “Two or more individuals operating bicycles upon a highway or street shall not ride more than two abreast except upon a path or portion of the highway or street set aside for the use of bicycles.” Drivers should give three feet of space between them and the bicyclist furthest in the lane. Bicyclists should not ride more than two abreast. Does the three-foot rule apply if a bicyclist is traveling in a bike lane? Yes, drivers must give three feet of space regardless of if the bicyclist is in the roadway, shoulder, or in a bike lane. What is the punishment for passing with less than three feet of space? An improper passing ticket is a three-point violation and is a civil infraction under MCL 257.636. There is no jail sentence for civil infractions. Civil infraction fees are set by local jurisdictions, but the range, based on the Supreme Court Recommended Range of Civil Fines and Costs for First-Time Civil Infractions for an improper passing ticket is $99-$117. Examples of local improper passing tickets, if paid on time, include Detroit ($130), Grand Rapids ($124, and for all accidents, add $30), Ingham County ($125), Ann Arbor ($140), Kalamazoo ($115), Marquette ($125), and Midland ($135). Since improper passing is a moving violation, the court fines go to the local court, and the fees go to fund Michigan libraries. Yes. Unsafe passing can be enforced similar to other moving violations such as speeding, careless driving, seatbelt violations, failure to stop, etc. An officer that witnesses an unsafe pass can issue a ticket or warning. Likewise, a driver who actually hits a bicyclist during a pass could be issued a citation, in addition to other moving violations. Additionally, other states and communities with safe passing laws have found effective ways to perform targeted enforcement campaigns aimed at educating the public. The City of Grand Rapids is the first municipality in Michigan to equip police officers with handlebar mounted ultrasonic radar detectors capable of capturing the passing distance between vehicles and bicycles. Can a cyclist make a complaint against a driver who passes too close? Yes. However, because law enforcement did not witness the infraction, the driver will not necessarily be issued a ticket. Regardless, LMB recommends recording the driver’s license plate and filling out an incident report against drivers who pass dangerously close. Doing this establishes a pattern of behavior against these motorists. In the event law enforcement does witness a close pass, having a recorded history of violating the law could result in more severe consequences. Additionally, reporting close passers puts law enforcement on notice to take proactive efforts to educate the public and enforce the law. Will this law strengthen legal avenues for a bicyclist that gets hit by a motorist? What if the bicyclist loses control because they get buzzed by a driver? Yes. A crash that occurs due to a motorist passing too closely is clearly a violation of the law, meaning it is subject to the penalties associated with that infraction on top of any penalties resulting from other factors contributing to the crash. Is the distance measured three feet from the bicycle’s handlebar to the vehicle’s side-view mirror? Yes. The distance is measured from the widest part of the vehicle and the bicycle. Do the various local five-foot ordinances still stand? 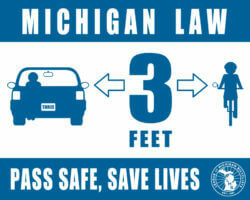 Can other cities in Michigan still opt for five feet in their jurisdiction? Ann Arbor, Dearborn, Grand Rapids, Kalamazoo, Kalamazoo Twp, Muskegon, Norton Shores, Oshtemo Twp, and Portage have all adopted five-foot passing ordinances. LMB has received conflicting opinions as to whether these local ordinances remain in effect or if new local ordinances can be enacted. Though it remains unclear at this time, LMB’s interpretation of existing case law is that local ordinances can stay in effect. LMB will continue to monitor and research this issue. How will motorists become informed about the new safe passing laws? LMB is launching a campaign to disseminate information about the new laws to bicyclists, law enforcement, and the public at large. As a first step, new yard signs and stickers will be available for purchase with proceeds supporting our efforts to educate the public. LMB will work with the SOS to ensure that information about the new laws is incorporated into the drivers education curriculum. 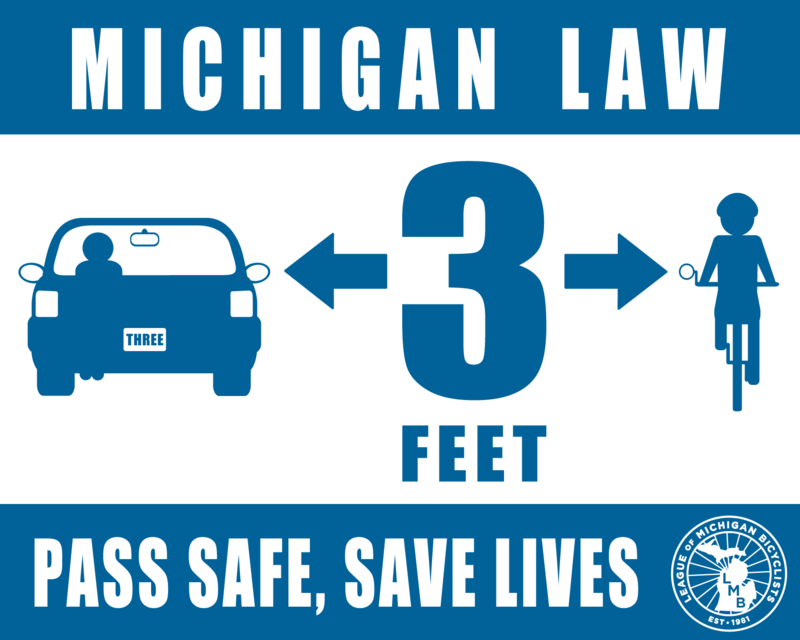 Additionally, a national three-foot passing sign standard is under development and should be available for use by Michigan road agencies in 2019. How can I help? Can I make a contribution? Donations to help fund our safe passing campaign are always appreciated. You can make a contribution at www.LMB.org/safepassing. As always, joining or renewing your membership or making a donation help to fund all of our education and advocacy work. Additionally, proceeds from the sale of LMB’s safe passing yard signs will directly fund our efforts to inform the public about the new laws. Supporters can find information on how to join, donate, or purchase yard signs at www.LMB.org.